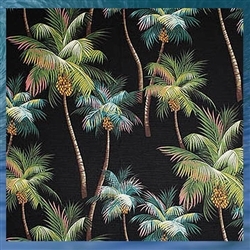 This Palm Tree Sham is made with Bark Kahala Fabric! DM515 - Pillow Palms - Inspired by old Hawaiian plantations, this design features palm frawns, and palm trees over a solid background. This tropical comforter is made from a high quality Heavy duty Bark Kahala fabric, it is basically upholstery weight! A little more pricey, but worth the extra money. 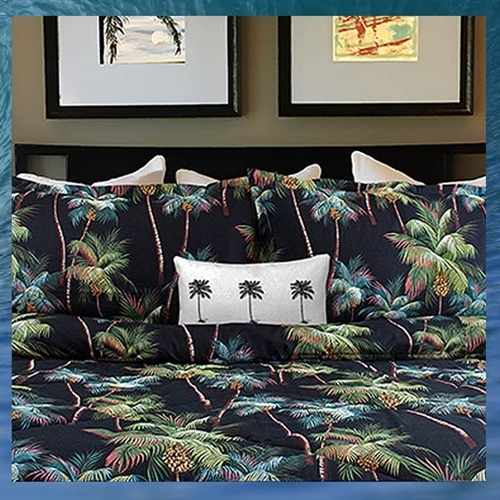 Dean Miller's palm tree pillow shams are also a great compliment to go with any bedding options you currently have, we can always add a little aloha to any beach house. Click on the tropical photo for a larger view or scroll your mouse over the Hawaiian bedding swatch pictures for detailed product shots. If you have any questions or concerns about our palm tree shams, or want to order over the phone, please remember you can always call us at (949) 370 - 6535 or chat online with one of our helpful customer service reps!